Was sitting with my mom today and the talk turned to knitting. I asked her if she taught my younger sister to knit and she said yes, I did it the same way as with you, by winding little toys into the ball of yarn (think we were both between 8 and 10) So I asked her, who taught you to knit, thinking it would have been her mother, my grandmother who died before I was born. Mom surprised me by saying no, I learned in the Girl Scouts and we made squares to make into blankets for the troups in WWII. My mother is going to be 79 this summer. Anyone else learn how to knit in the Girl Scouts for the same reason?? Yes, my mother remembered the Red Cross giving yarn to the girls in her high school in the 1940s to knit for some WWII related project. I'm not sure if it was squares. She said the girls took the yarn and didn't knit. Well, maybe the mothers were too busy working building ships or planes to teach their daughters to knit. 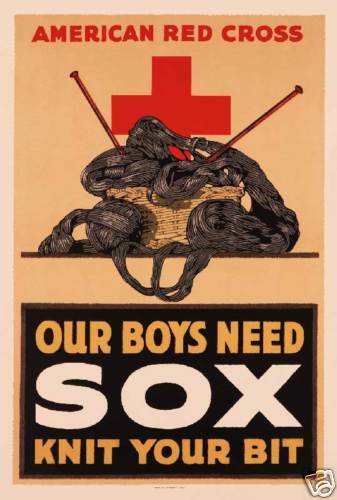 I believe that most of the WWI and II knitting projects were organized by the Red Cross. I have also heard of something called Knittin for Britain ? Okay UK folks jump in here on that one ! Just fun here are a couple of knitting for the war items. 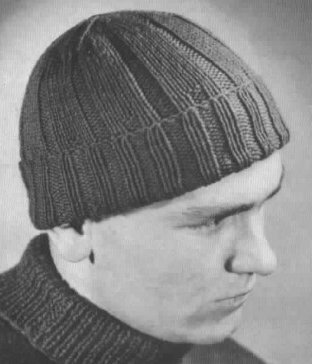 I have also included a hat pattern from WWII that I have used for charity knitting. MATERIALS-- Bear Brand or Bucilla "AA" De Luxe Knitting Worsted, 1 skein, or Bear Brand or Bucilla Standard Brand Knitting Worsted, 1 skein. 2 Pairs (4) Bucilla White 10-inch Double-pointed Knitting Needles, Size 4, Article 3843. Cast on 96 sts, 32 on each of 3 needles. Join and work in ribbing of k 2, p 2 for 6 inches (about 42 rounds), then work in ribing of k 6, p 2, for 22 rounds. K 1 round plain. Decrease 1 st at both ends of each needle, as follows: * k 1, slip 1, k 1, pass the slipped st over the knitted (slip-k-pass), k to within 3 sts of end of needle, k 2 together, k the last st; repeat from * until 4 sts remain on each needle. Break off yarn, thread end into a darning needle, draw through all sts, twice, tighten and darn in end. 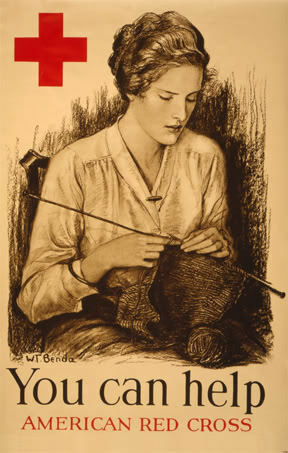 I was taught to knit by my Mum in WW2 in the air-raid shelter when I was 7 yrs old. She used to go to Jumble sales buy old woolies and we used to unpick (frog) ,skein ,wash and re knit. We seldom got new wool and if we did it was rationed and on coupons we used to save coupons for shoes and underwear She taught me to knit beacuse it took our minds of the bombing. Scary at 7 years old. We lived in a dock area where the troops and equipment left for Europe so we spent almost every night in the shelter. What beautiful memories, love to read these posts. Thanks for sharing this wonderful bit of history. I've always wandered... why are there separate girl and boy scouts? 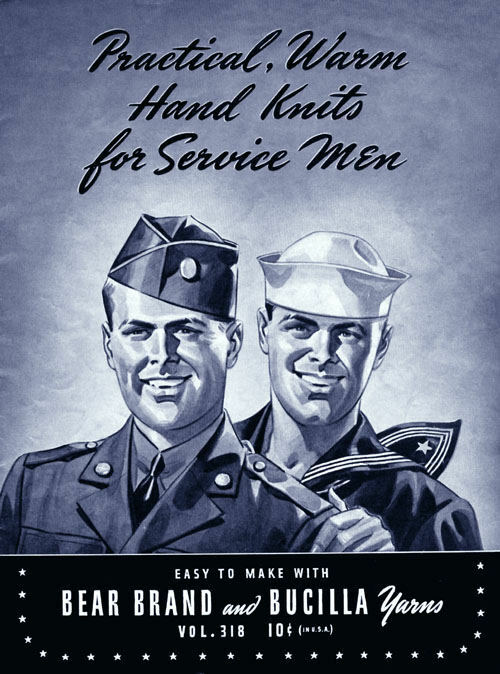 My Mom knit for my Dad all throught WWII and I still have many of her pattern books, although the metal needles have rusted and been thrown away. I learned in Girl Scouts after the War (probably about 1948) and have knitted ever since (am 70 this year). There were separate girl and boy scouts because their projects were geared for boys to do manly things and girls to do womanly things. Girls didn't chop down trees or build boats and boys didn't learn to take care of babies and sew. My mother received yarn and a book to knit for the military during WWII. I still have the book. Hers included a sweater for a man in bed, it went over the head, had long sleeves and a front, no back. There are patterns for vests, caps, shooting gloves and mittens and socks. My sister and I could knit so we helped by doing the straight knitting when she wasn't working on the project. A lady from England said her mother knit in the shelters at night. Expert knitters don't need much light. School children in rural schools knit squares that were sewn together and while outdoors, collected the fuzz from milkweed to stuff jackets. Everyone helped with the war effort. Baden Powell was the originator of the Boy Scout Movement. The girls discovered they were having so much fun that they wanted to join in too - so the Girl Guides (Girl Scouts) was formed soon after. Cub Scouts were (are) the younger boys and Brownies are the younger girls in the Guide Movement. Rovers (boys) and Rangers (girls) are the older teenagers. Brings back fond memories of my own youth and then in my mid twenties (in the 1970s) I set up a Guide Company on an Australian Aboriginal reservation in South Australia and was the Captain for a couple of years but then my husband was transferred back to Adelaide and I had to leave the girls. A couple of years ago I visited a Craft Show in Adelaide and there sitting at a table giving demonstrations of craftwork was one of the girls in my Guide Company - she's running a craft group for under-privileged youth here in Adelaide. We had a great chat about Guides and how it had influenced her life. But, Carol, there are still separate boy scout groups and girl scout groups? And the children are like 5 - 10 years old? I wouldn't let a 6 - 7 year old hold an ax and definitely would not put a needle in a 5 year old hand... I just wander why are they now separate? Or do the movies just mislead and feed false information on this one? Like... there is something called girl scout squirrel cookies? (and are there any squirrels inside the box?..) - but are there boy cookies and mixed gender too? And how come no one founded any mixed groups?